Historic New England’s Team Leader for Collections Services Julie Solz recently presented a Community Preservation Grant to Edward D. Baker, executive director of the New London County Historical Society in New London, Connecticut. 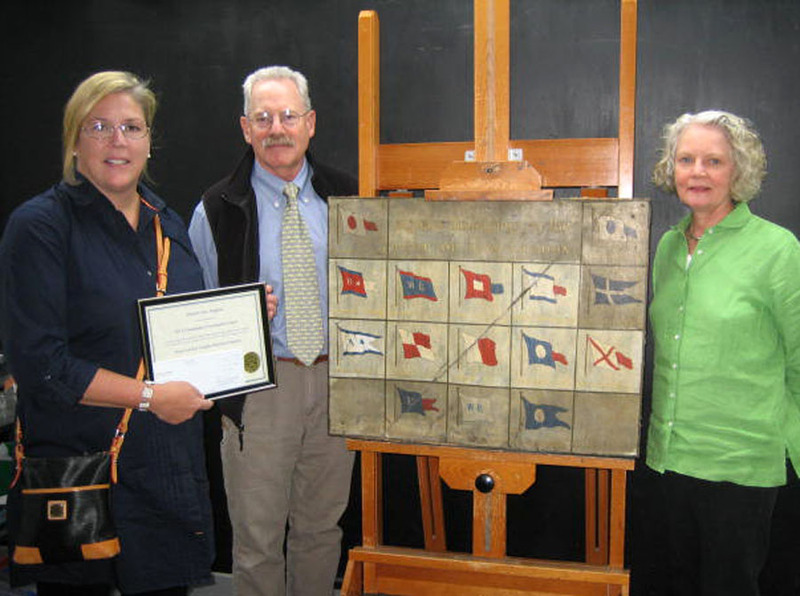 The award will help fund the restoration of an 1846 painting by John Ewen Jr. that depicts fifteen “signals” or “house flags.” These flags identified ships and the New London whaling firms that owned them in the middle of the nineteenth century. The work, which includes removing accumulated grime, repairing the canvas, and doing some infill painting, is being done by conservator Gay Myers. The photo above shows the conservation work in progress. Grime has been removed in the large area at the center, and the removal of yellowed varnish has begun revealing the bright blue and white paint of the flag at left. Each year, Historic New England awards Community Preservation Grants to organizations in all six New England states to support historic preservation projects in communities throughout the region. Learn more.